If NASA holds to it's previously discussed schedule, we should know in a month or two which of the three proposals it is considering will be its next Discovery program mission. This program funds low cost ($425M for the spacecraft, instruments, and operations and analysis; NASA picks up other costs such as launch vehicle) missions throughout the solar system. Below, I've reproduced slides that summarize each of the current candidates from a presentation given by Jim Adams, Deputy Director for NASA's Planetary Science Division a year ago. (Readers with good memories may remember these slides from a post last May.) At the end of this post, I also provide links to my own summaries of the proposals, which typically include links to more detailed write ups. Editorial Thoughts: The program has been spectacularly successful with ten past missions ranging from Mercury to the asteroid belt and just a single failure. (See the Discovery home page for a full list of the missions that have flown.) Unfortunately, in the President's latest budget proposal, the rate of Discovery missions per decade will drop to around one every 4.5 years compared to the Decadal Survey's recommendation for a mission every two years. Given this program's past success and the high quality of the current finalists (and the presumed high quality of the missions that just missed the finalist cut), I think this proposed is unwise. If Congress chooses to increase NASA's Planetary Science program's budget above the President's proposal, I believe that the Discovery and its sister New Frontiers programs deserve to receive additional funding to allow more frequent flights. The House bill would do this while the Senate bill does not. The final budget may not be known until the end of the year. In the meantime, it's hard to predict which mission is likely to be selected. 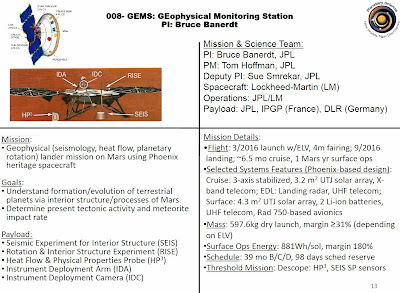 The Mars Insight mission is likely low risk since it reuses the Phoenix mission's design and incorporates mature instruments. 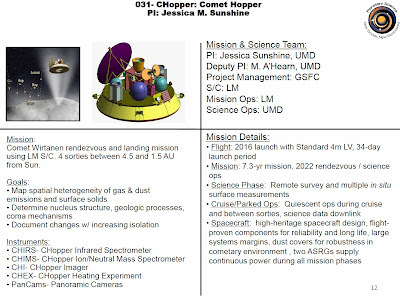 The Comet Hopper (CHopper) proposers likely have to convince reviewers that they can implement the complex mission mission operations of repeated landings within the budget. The Titan Mare Explorer (TiME) proposers likely have to convince reviewers that an outer planets mission to a hostile environment (the lakes on Titan are frigid) can be done within the budget cap. However, the proposers for all three missions are highly experienced, and they will have had a laser focus on resolving these issues. If all three are judged to be low risk and financially feasible, then NASA will have a tough choice. The Insight mission would provide continuance for NASA's Mars exploration program between the 2003 MAVEN mission and the next mission in 2018 or 2020. The CHopper mission would be NASA's first to rendezvous with and land on a comet for extended observations. And the TiME mission would continue NASA's outer planet exploration beyond the missions already in flight. 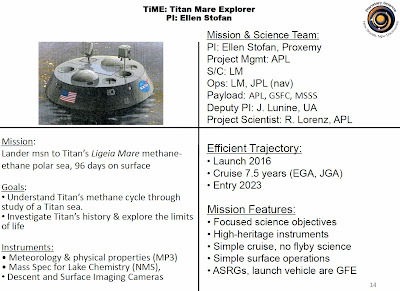 In this situation, the TiME mission may have an advantage given that it must be selected in this competition to launch in time to be able to land on the northern lakes of Titan and still communicate directly to Earth. The other two missions could be flown following future Discovery competitions (although CHopper likely would have to fly to a different comet). As for my preference, I'm greedy. I want to see all three eventually fly; hence my desire to see the highest flight rate possible for the Discovery program. 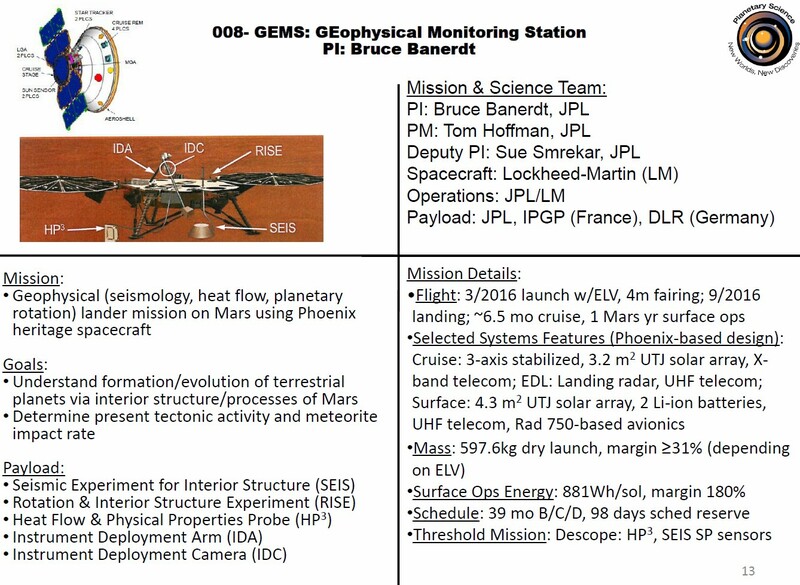 Mission summaries from a presentation by Jim Adams, Deputy Director for NASA's Planetary Science Division. Double click on the images to read the full slides. You can see the full presentation here. I'm biased against Mars missions simply because they get an overwhelming proportion of the funds. For that reason and because we have so much data already on Mars, I would exclude it. The comet hopper looks interesting, however, there is already the ESA mission doing similar things if not more. Personally, I strongly prefer Titan MARE. It's an amazing low cost opportunity to land on an truly alien sea, with interesting complex chemistry and test new Stirling technology. The wow factor, even for the general public should be substantial, even in these days of low interest for science. The prospect of monitor Titan lakes intermittently for years it's also very appealing. An entirely reasonable way to decide your take on priorities. The one word of caution is that we don't know what NASA has concluded about the technical and cost feasibility of any of these proposals. At this stage, that will likely be a deciding factor. I see 3 priorities: economic growth, finding microbial life, finding animal/ET life. The Chopper: I'd think you'd want to see what NEOs are around us that we'd potentially want to mine/harvest, first. If there isn't anything nearby and safe, the comets aren't that useful. Mars is too small for animal life. It can't hold its oxygen atmosphere, right? The atmosphere of Venus and Titan are more interesting, from the PoV of seeing where GOP/CPC are taking our planet. Wouldn't the geology of Triton and Venus be better for learning about our geology? Mars has weathering, so doesn't this make mining craters hard? I like mining Lunar Impact breccia for rare earth minerals. I think this needs in situ propellant and other industrial processes first. Say, ovens and stuff on ISS vacuum.